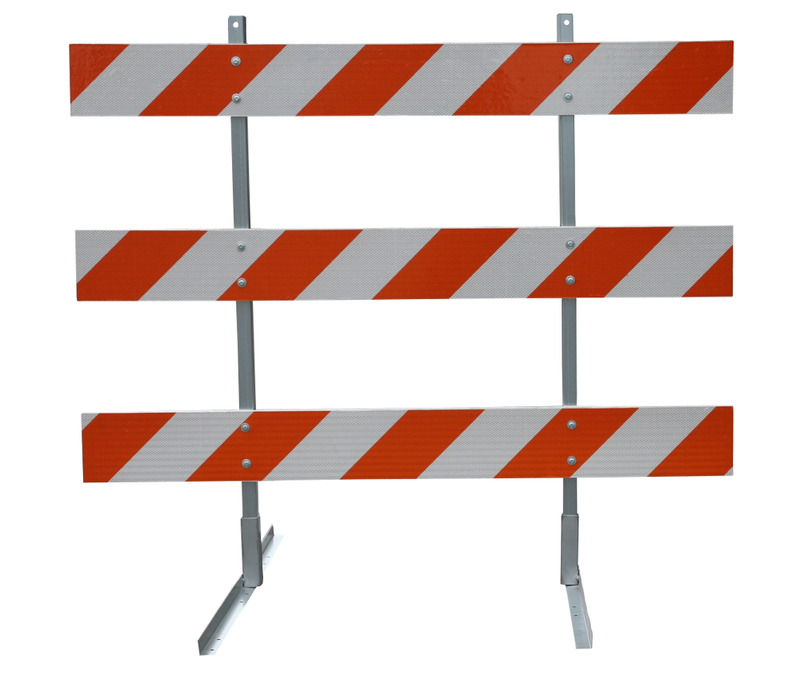 Type III Wood Barricades, Traffic Barricades, 120" Type 3 Barricades from Trans Supply.com! This unit can be purchased fully assembled or as parts to assemble if desired. The components of this barricade can be used across different size type 3 barricades listed here and the legs and boards can be bought separately. The upright is durable and hot rolled carbon steel and the stand is a 2” x 2” square tubing receiver. This wood barricade can accept a barricade light on each side. Permanent or short term fastening available due to the design of the base. Let us know if you need product approval letters, we have them from FHWA and more. Powder coated enamel paint helps to guard the frame and base from the environment. Reflective sheeting is available on both sides on these Douglas Fir Pine boards. What sheeting options are there? There are multiple sheeting options, and starting with the highest reflectivity is Diamond Grade, the middle of the line is Hi Intensity and the least reflective option (but works for most application) is Engineer Grade. Can a barricade light be mounted on this Plywood Barricade? Yes two barricade lights can be mounted on this unit. Can I dictate the direction of the sheeting? Yes, just let us know the direction you need. Do you make barricades bigger than 12 feet? We can make type 3 barricades that are wider than 12 feet, just let us know what you need and we will get you a quote. What is this barricade composed of? The boards are Douglas Fir Pine and the legs are made of steel. Does this unit come complete with legs and all hardware? Yes this is a complete barricade. If I were to order soon, when would I expect to see these? What you order, how many you order and what other orders are in front of yours all influence lead time, so it’s best to just call us directly and ask. Transit time once it leaves the facility is 1-3 days for the West Coast and 4-5 days for the East Coast.